Episode 20 – Jamie in our pockets! Hello everyone, and welcome to Episode 20 (we never thought we’d make it this far!)!! Thanks for coming back and if you’re new, thank you for checking us out!!! Also, a big Thank You to Dawn of the Wolfe Farms Podcast for mentioning us on their podcast – when she got the little care packet from Katy in the mail! So glad you liked it!!! AND Katy won a lovely project bag from KnitRunDig from the Geeky Girls Knit podcast!!! Thanks so much ladies! We had a very generous donation of a lovely prize from The Wooly Witch!!! She sent us 2 ounces of her ‘Sweet Rolls’ spinning rolags in the colourway ‘The Waterhorse of Loch Ness’! Now in celebration of the return of ‘Outlander’ to television (April 4th in the States and April 5th in Canada) we are giving these 2 ounces of spinning rolags to one lucky listener. All you have to do is head over to our Ravelry group, and take a look at the Wooly Witch’s etsy shop and tell us what your favourite colourway is and what you would make with it! You must be a member of our Ravelry group to win these gorgeous rolags. Valerie has been watching the mystery afghan CAL with the Crochet Crowd and is liking some of the entries and colour combos but she doesn’t think she’ll cast on any time in the near future. She also recommends our listeners checking out the “Yes, Yes” Shawl Challenge that is going on at the Crochet Crowd until April 15, 2015. It is a challenge aimed at helping crocheters to learn how to read crochet diagrams. 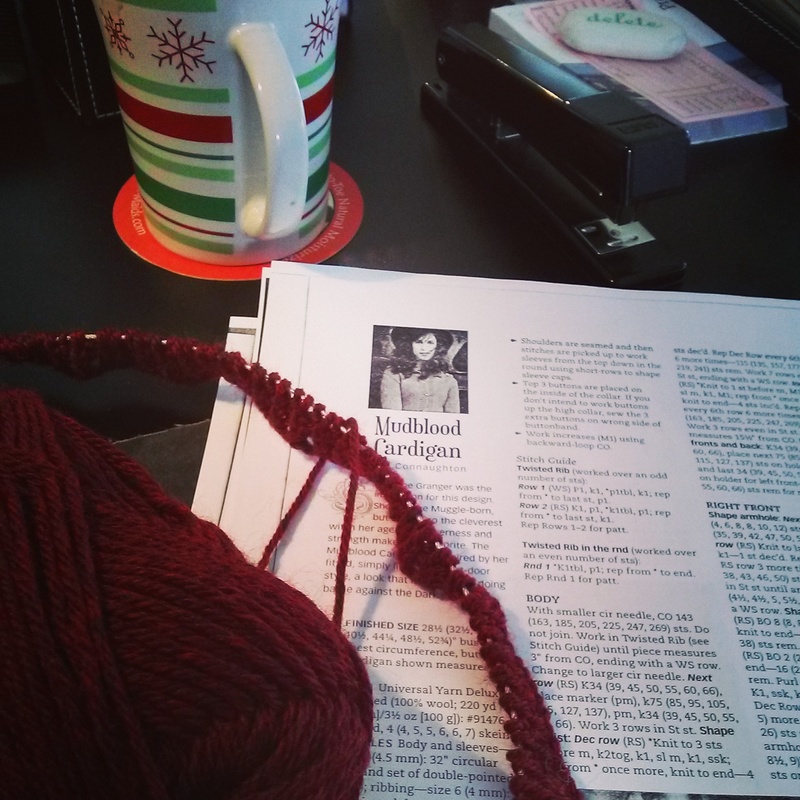 Katy is still participating in the Behmalong with the Knitmoregirls podcast. Also, there is the instagram KAL/CAL ‘#kiltmenowkal’ being hosted by The Knitmore Girls Podcast, The Geeky Girls Knit Podcast, The Subway Knits Podcast and the Yarngasm Podcast. Just post a picture in instagram of your projects that are somehow Outlander related and you’re in for some great prizes. Katy has nothing. But she will make up for it in WIPs. Valerie finished a corner to corner dishcloth using Bernat Handicrafter Cotton in “Chrysanthemum”. 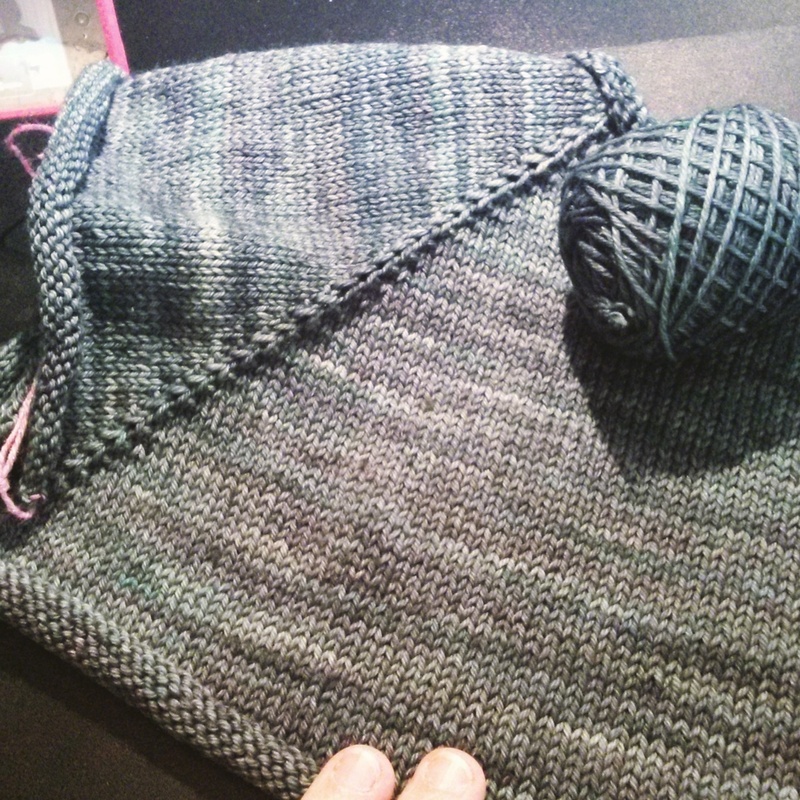 For a HO, Val is still working on her Easy Triangle Shawl from LionBrand yarns and is making slow progress. Valerie is working on her Corner to Corner crocheted baby blanket for her friend. She is also working on another dishcloth to add to her gift stash. Katy cast on The Mudblood Cardigan using Knitpicks SW Wool of the Andes in Garnet Heather and she also cast on the Mama Vertebrae cardigan using Malabrigo Arroyo in Aguas. Need – Val needs to organize her patterns and knitting needles into a binder. Katy needs to send out her Spring Swap package she signed up for with The Sampler Girl Podcast. Want – Katy wants more Malabrigo Arroyo, she’s loving it! Val wants to see Dreamworks’ Home and might go with her husband as a little date night or afternoon! Want to do – Katy wants to go and visit her friend Patti in Toronto and to visit Passionknit! Valerie wants to go on some walks now that it’s SPRING and walk at the local park that is nearby and take lots of pictures for Instagram. What did we Learn – Katy learned that coffee is her friend! Katy got a few things in the mail. She received her ‘I Ain’t Fraid of no Girls’ tee shirt from Teefury and she loves it! 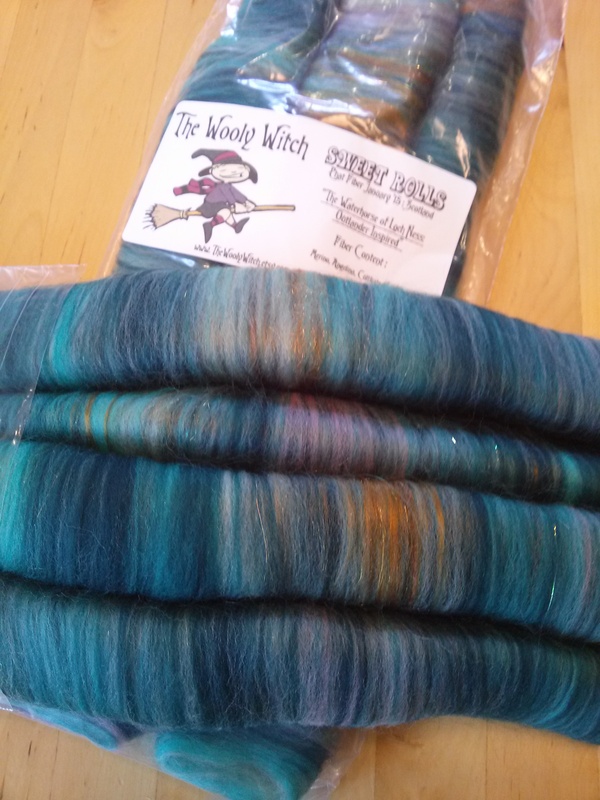 She also received her Malabrigo Arroyo in Aguas on a Ravelry destash, her rolags she ordered from The Wooly Witch and she squealed when she received her skein of ‘Zombody Loves Ewe’ from Desert Vista Dyeworks. Val got a sweet roll sample from the Wooly Witch (Thank you Katy! ), and it’s in the colourway “Pumpkin Spiced Latte” – she loves it! You had me at yarn! Katy fell hard for Miss Babs, the huge ‘Yowza! 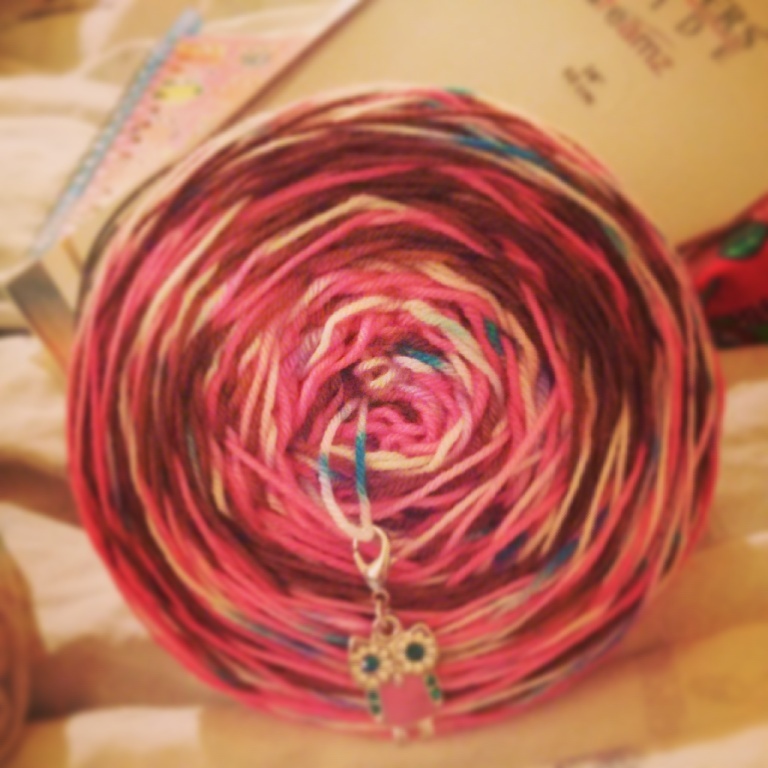 Whatta Skein’ skeins in particular, in the colourways ‘Wanna Go Crazy’, ‘Spread Your Wings’, and ‘Hot to Trot’. Valerie fell victim yet again to Expression Fibre Arts and her new colourway called ‘Unicorn Breath’ … which we find is a nice name for this beautiful, yet bright, pastel rainbow! She also fell in love with ‘Prismatic’! Katy has almost finished ‘The Clockwork Scarab’ by Colleen Gleason. She also watched ‘Catching Fire’ …again (gah… Peeta!) and she watched ‘The Fault in Our Stars’ and loved it, even though it was sad in some spots. She caught up on listening/watching The Geeky Girls Knit podcast and is still listening to ‘Style’ by Taylor Swift, ‘Take me to Church’ by Hozier and ‘Coming of Age’ by Foster the People. Valerie is watching ‘The Walking Dead’ and looking forward to the Season Finale on March 29th (everyone will have seen it by now 😉 ) We’re both really looking forward to the midseason return of Outlander as well… we want to know how Jamie fared sitting in a window for months on end!